The second mode of the PPP module is 3D model building. This will use the calibration parameters (i.e. 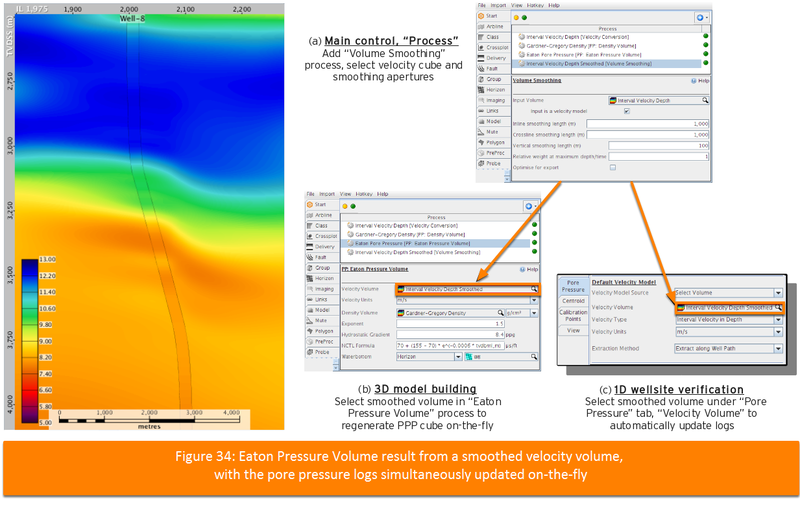 overburden pressures, NCTL models, and Eaton exponents) plus a 3D velocity model. The 3D model building processes are found in the main Control Panel Process tab. As with other processes, these create new output volumes for use throughout Insight, including within the PPP View. However, before building a 3D model of PPP from the velocity model, it should be verified at the wells. The same 1D well calibration workflow from Normal Compaction Trend Lines, Eaton's Method and Miller's Method apply, but instead will use a global NCTL volume (for Eaton's method) and OBP volume, with the aim of creating a 3D model that will tie the wells. Just as in 1D well calibration mode, all 3D model building is conducted in depth (TVDSS). The velocity domain used is Interval Velocity In Depth. Table 3 shows the available velocity domains within DUG Insight. Figure 24 shows the Velocity Conversion process, used to convert between the various types. Typical velocity model sampling is 20m (in depth) or 24 ms (in time) sampling, on a 100-200m grid. To ensure velocity volume types are detected correctly, ensure the Class is set correctly upon importing. This will happen automatically if the velocity volume has the correct filename extension. Note: DUG Insight Interval velocity convention is top-posted, meaning any sample in the volume represents the velocity value from that point down to the next sample. Now that we have an Interval Velocity in Depth volume, the OBP is calculated via the integration of a density volume (which is a function of velocity). Figure 25 shows how to create a density volume using the PP: Density Volume process (see also Pore Pressure: Density Volume). Note: The density volume process will ideally use a waterbottom horizon tied to the well waterbottom (set in Well configuration, Normal Compaction Trend Lines, Figure 12), and use the same Water Density and Default Shallow Power used in the 1D well calibrations (see Eaton's Method and Miller's Method). 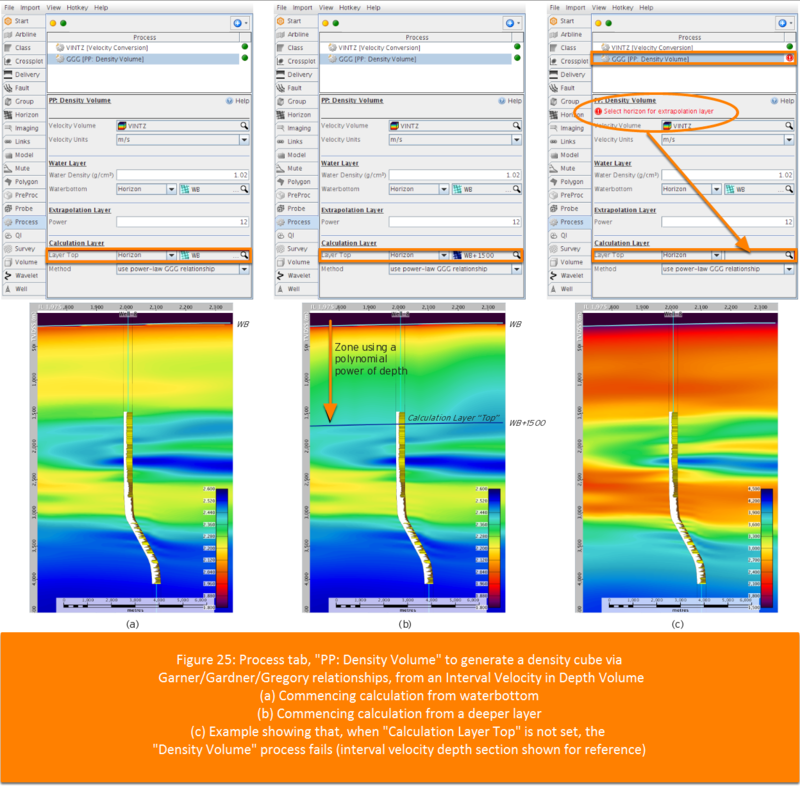 To apply this density volume for OBP calculation at the well location: under the PPP module, OBP tab, select the Density Volume (in TVD) and set Specific density settings for well to Use density from volume (Figure 26). 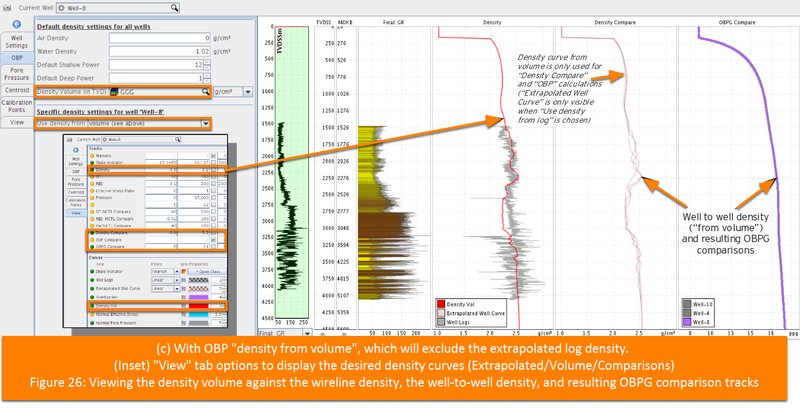 Figure 26 also shows the well-to-well density volume comparisons, as calculated from the velocity model (similar to Figure 6, which compared density extrapolated from well logs). To assign the velocity for T/D conversion, select Configure Time/Depth Conversion (Figure 27) in the File menu of the Insight control panel. 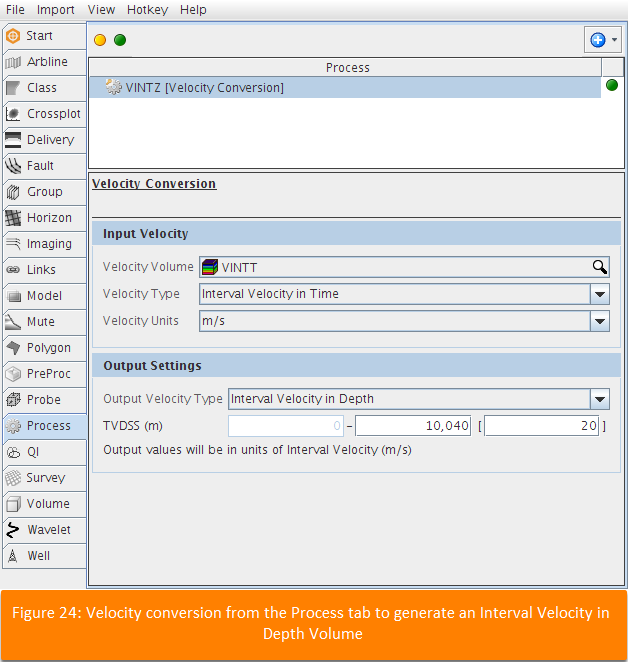 The selected velocity model will be used to convert between TWT and TVD throughout Insight. Verify the Velocity Type and Velocity Units. Alternatively, you can use the volume selected for Insight depth conversion by setting Velocity Model Source to Inherit from T/D Settings. Extract along Well Path follows the wellbore path, straight or deviated. Average requires a Search Radius (m) around the well (top hole location), from which velocity traces are extracted and analysed for the P10, P50, and P90. 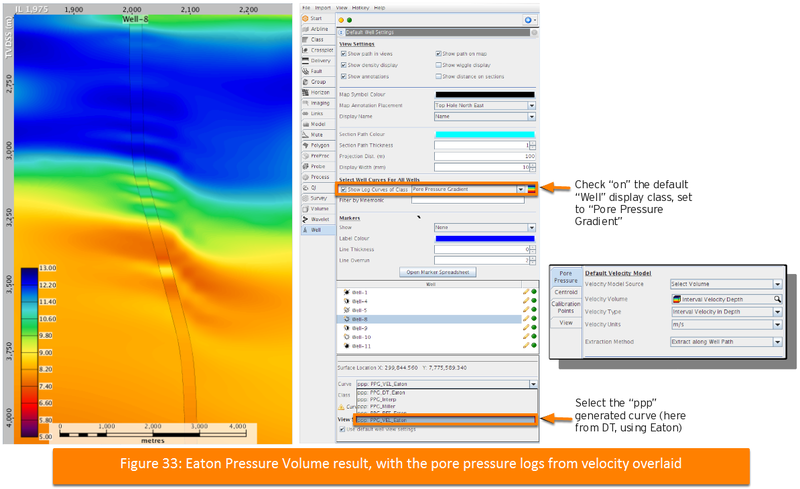 To see the velocity profile: under the View tab, Curves section, choose Velocity Model. It will appear on the DT track, converted to slowness along with wireline sonic logs and NCTL curves. Figure 28 shows an example velocity trace extracted along the wellbore, both single and averaged. Note: The selected Velocity Volume and Extraction Method can be overridden for any particular well under the Well Settings tab. The (safest) default is to choose the Velocity Model Source as Inherit from PP Settings. Finally, a global NCTL function must be designed, which allows verification of Eaton's PPP from the velocity. 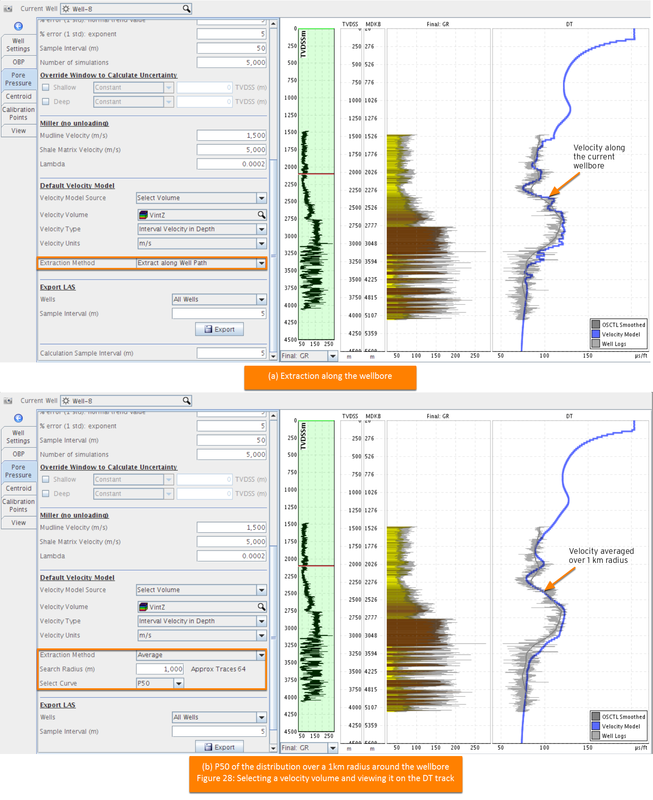 Under the Velocity NCTL section of the Well Settings tab, a common formula for all wells can be designed to best match the pore pressure predicted from the wireline logs. 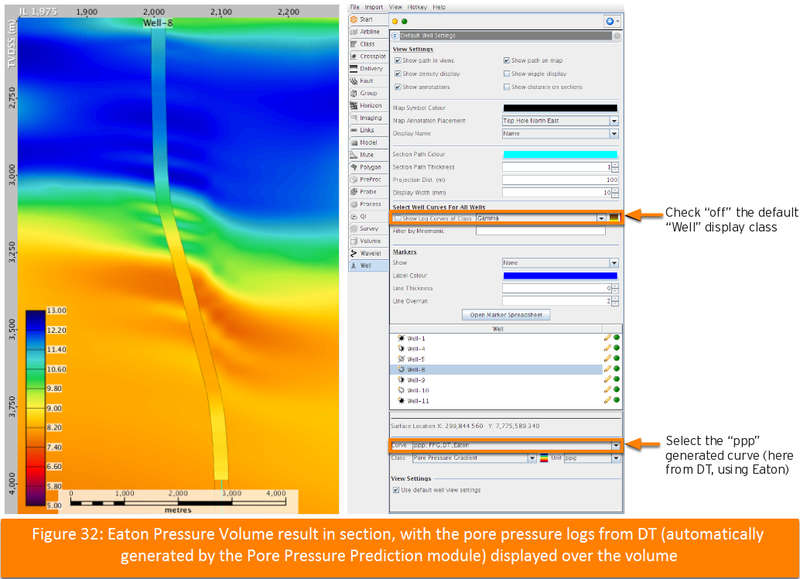 Figure 29 compares the pore pressure prediction at a well from both log (DT, smoothed) and velocity model. Figure 29 also shows the well-to-well density volume comparisons, as calculated from the velocity model (similar to Figure 11 which compared density extrapolated from well logs). Figure 32 shows the results of the Eaton Pressure Volume process, and procedure to select the Well curve, in this case the DT_Eaton result. Figure 33 shows the same results with the logs from VEL_Eaton overlain, and setting these logs to the global Pore Pressure Gradient well curve class. Figure 34 shows how to apply a Volume Smoothing process to the velocity volume. This process is then used on-the-fly for the 3D model building and 1D log generation.